Being a volunteer at Zavod Voluntariat, I was offered the possibility to apply to SCI grants. I was happy about the opportunity to receive funding for activities that will benefit the community. After all, I’m a millennial and we search for possibilities to make an impact and leave something behind us. 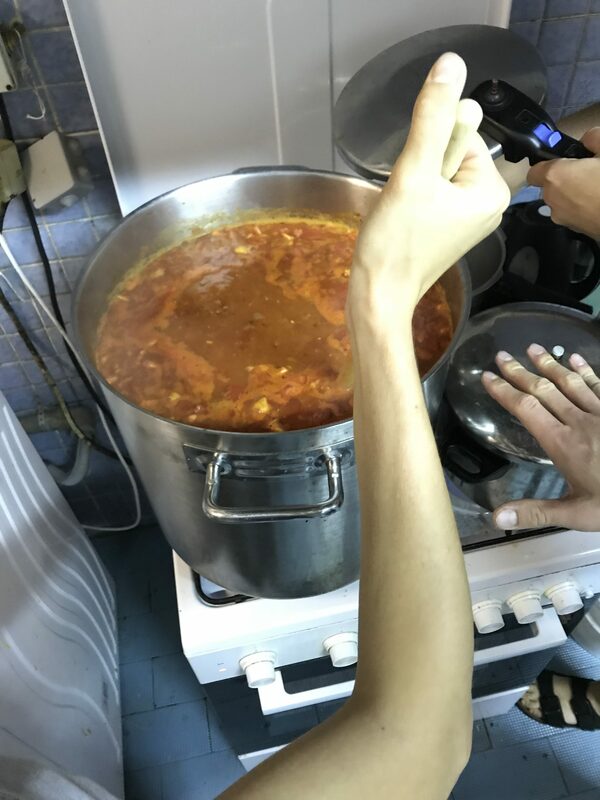 The first SCI project I applied to, managed, volunteered in and now reporting about, was a two days workcamp “From Food Waste to Taste” from 13th to 14th of September. How did it all start? Well, as I mentioned above, it came from the will to take concrete steps in fighting food waste. Wasted food is bad for the environment, as each ton of food waste produces 4.5 tons of CO2 emissions. Hence, together with Park Istra, we organized a workshop to make our participants aware of the importance of food. 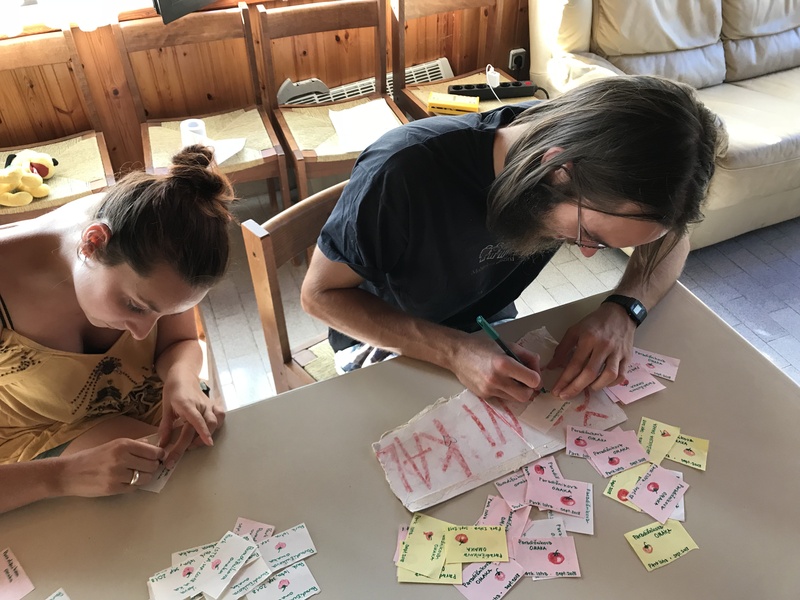 The workcamp took place in Istra region, which is a socially underprivileged region in Slovenia. Managing the project was a bit challenging, because in the last minute we had to anticipate the dates of the project by 3 weeks. This turned out to be both good and bad for the project. On the one hand, the farmers benefited more from our help as they needed more hands before 14th of September. 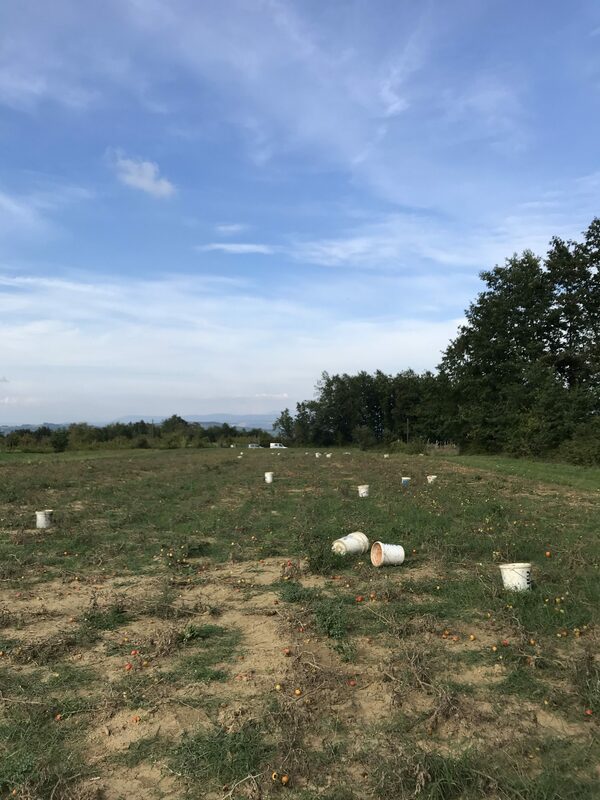 Moreover, when we got to the fields we noticed that many tomatoes were already rotten. On the other hand, instead of having 12 participants, we had half of the applications, and 2 canceled in the last minute. In the end there were 4 of us, 2 Slovenians and 2 Internationals going to the workcamp. 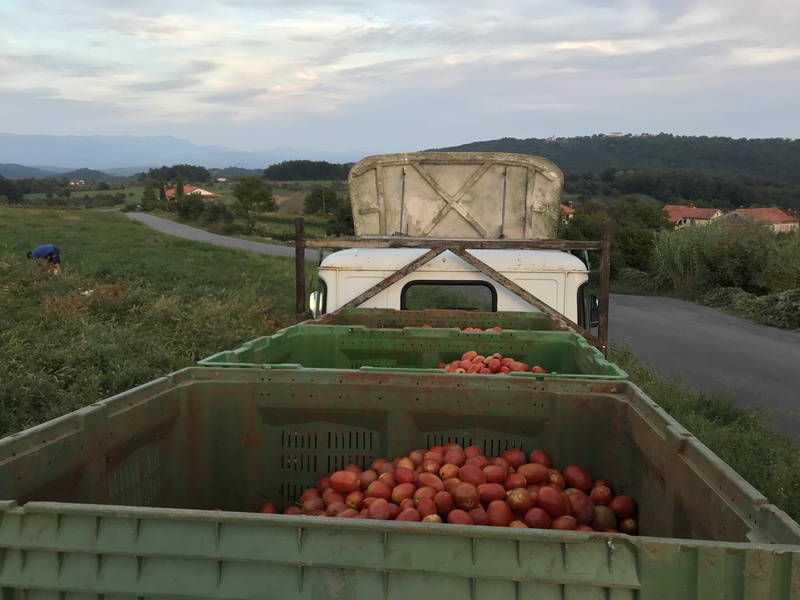 On the first day, we went to the small settlement close to Croatia, Koromači/Boškini to pick up tomatoes. I was really excited about this part. First of all, being a city person and having my grandparents in the capital of my country, I didn’t have the opportunity to do something similar before. The project only benefited from my naivety, I wasn’t aware what I was getting myself in. Secondly, the farmers really needed our help. Thus we knew that we will definitely have an impact on the life of a concrete family. 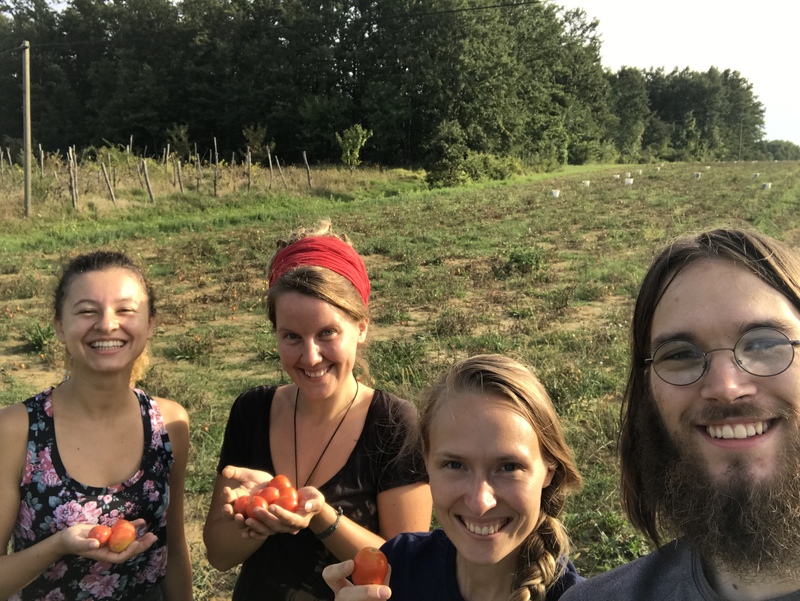 They told us that people do not want to pick up tomatoes even if they are payed and they don’t have enough hands for all the fields they own. For this reason, without our help this tomatoes would have rotten. Thirdly, we didn’t buy tomatoes for our salsa, but we worked for them. Am I moving to a farm after this experience? No way. 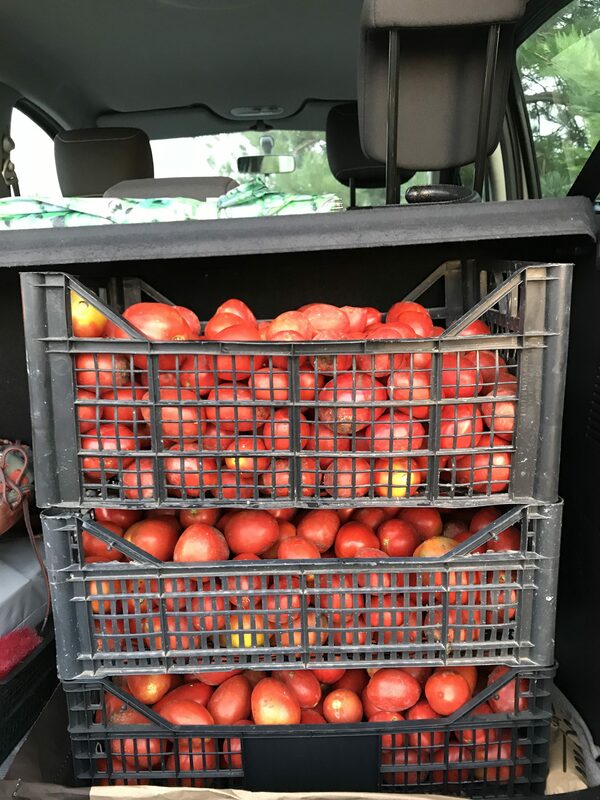 Will I appreciate more the tomatoes that I buy? No doubts. If the tomatoes picking was tiring, the salsa cooking was truly exhausting. The whole day we washed and cut tomatoes, onion and garlic. 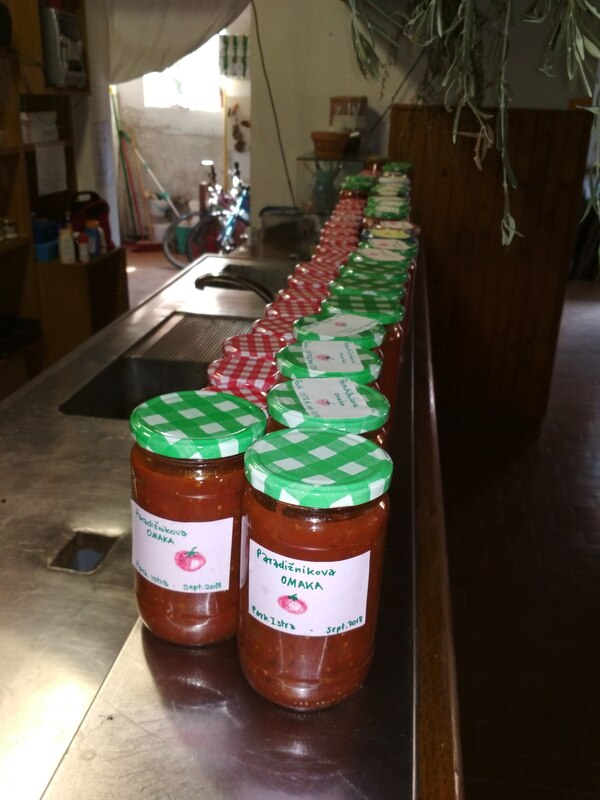 At the end of the day we had 50 jars of tomato sauce, that were donated to the Red Cross and Caritas. Staying in Park Istra, showed us a different way of living, the one of a community. A few examples that I could mention are the system for washing dishes, helping the local community day by day, and sharing the food all together. On the tomatoes fields future projects were born. With one of the volunteers we are applying now to a bigger food waste project, while with the other we’re organizing DYI workshops on cosmetics. I’m sure the project had a positive impact on other participants and that we will think twice before throwing away food.